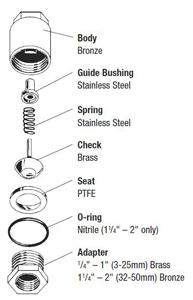 Spring Check Valves efficiently perform all of the functions of a swing check or vertical lift check valve.They have a low pressure drop, can be installed in a horizontal or vertical position, and work silently preventing the effects of water hammer. 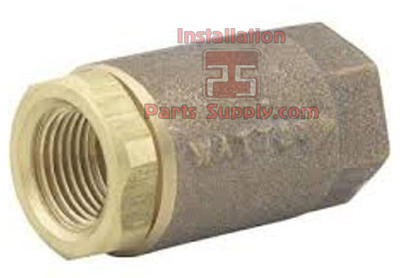 A bronze silent check valve shall be installed as indicated on the plans.The valve shall have a conical brass disc, PTFE seat and silent operation. Pressure rating no less than 400psi(27.6 bars)WOG non-shock and 15psi(1 bar) WSP. Valve shall be a Watts Regulator Company Series 600.